Blazer® uses the latest technology to make casual practice more affordable. Aircraft-grade aluminum is heat-treated to make a dependable, yet economical cartridge case. All the performance of brass, without the price tag. Loaded with legendary Speer bullets and CCI® primers, both with an extensive record of success. Shoot more often, stay under your shooting budget! 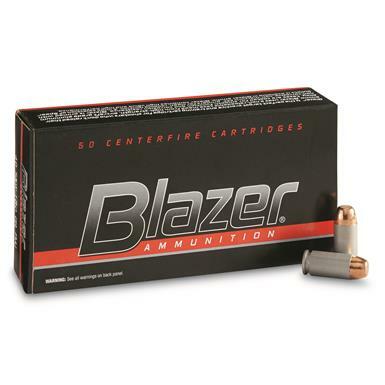 CCI Blazer Aluminum Case, .40 S W, FMJ-FP, 180 Grain, 50 Rounds is rated 4.9 out of 5 by 40. Rated 5 out of 5 by Sammy from Good price and no problems I have shot 200 rounds through my Walther PPS 40 and not one problem, no FTE, no FTF, nothing. Every round shoots the same allowing me to focus on accuracy. Rated 5 out of 5 by PAT1 from GREAT SERVICE! A GREAT PRODUCT AND GREAT SERVICE. GOT AMMO IN JUST A FEW DAYS OF PURCHASE. Rated 5 out of 5 by TrailMixNC from Rock Solid Range Ammo That's exactly what this stuff is for - to practice with so you don't waste your good rounds. Never had a problem after hundreds of rounds, and look forward to shooting hundreds and hundreds more. Rated 4 out of 5 by cooter pickens from grate stuff so like this stuff is like pretty good. not stellar accurate but good for target shooting. it like shoots grate in my ruger. ain't got no missfires or jams so far. Great price to! Rock on man! not match grade but awesome for you average dude. Rated 4 out of 5 by Magman from Great target or practice ammo I dont reload and often shoot steel or just paper plates so this ammo is great. Its not too dirty and is a lot cheaper than brass and lighter to carry 12+ boxes of .40 and 9mm to the range. Rated 5 out of 5 by Bertman from Good Price, and Fast Shipping Nice price on Ammo, and hit SG when they had a free shipping day...Can't beat that!! !